Aaron has checked in a change to the CHD format featuring his further work on the format, and bumping the version to v5. The created CD CHDs are SHA1-compatible with the previous ones, so none of the software lists need updating thankfully. Just a heads up, because unless there are any bugs this will be the expected version from the next release, as opposed to the previous FLAC trial runs. Old V4 (and below) CHD format used ‘zip’ compression internally. LZMA seems to give about 20% better compression than ‘zip’ on regular data. Of course some data just plain doesn’t compress well, so you’re not going to see those saving everywhere but you’re likely to see on average a 20-40% reduction in CHD size for all non Laserdisc CHDs. This naturally makes CHD better for storing large amounts of data, which was it’s original purpose. As it transpires the release of MAME 0.145 was meant to come with a ‘promo’ combined MAME / MESS build, at least that was the plan at one stage. Why that didn’t happen I don’t know. Maybe concerns about the overall stability of the 0.145 release giving a bad impression, maybe a lack of time, maybe some more boxes needing to be ticked with various devs, maybe some last minute conflicts which prevented it going ahead. Either way, it didn’t happen. Anyhow, there was some *official* code written for this purpose, similar to the last Ultimate patch I posted, but stripped down a bit further to the bare minimum of changes needed to build it. The code, written by Micko (MESS Co-ordinator) has been given to me, and I’ve uploaded it here. That code builds a variant called ‘universal.exe’ / ‘universal64.exe’. Given that it was the plan to include it at one point I’m cautiously optimistic that this may yet see the light of day in the official source trees (and maybe even as binaries) but we’ll see. This as suggested is built from the MESS SVN r14446 code. It includes everything from the MAME/MESS of that revision, including the 7-zip support for ROMs. As an additional option I’ve included extra binaries which are built as ‘MESS’. Those binaries will identify themselves as ‘MESS’ to external applications instead of Ultimate/Universal/MAME. This is done for compatibility with the QMC2 frontend. The MESS Version of the QMC2 frontend can be used with the ‘MESS’ binaries, because as far as it’s concerned it’s just a build of MESS with additional arcade titles. The actual MAME version of QMC2 is more stripped down and lacking in features needed to run various systems included in the Ultimate version, so you have to trick it into thinking it’s running MESS. If you’re not running / wanting to run QMC2 you have no need for these binaries. I usually provide a demo of some of the cool stuff / comparisons when I post one of these builds, but I haven’t really had much time to do anything like that with adding the various 7-zip, FLAC, APE and JPEG support as shown in prior posts. I’ll try and find something worth showing in the coming days tho, there is a lot of neat stuff happening in MESS lately such as the ability to run old versions of MAME on the 486 driver, but it doesn’t make for much in the way of screenshots, and it is a little slow to be of practical use regardless of the ‘cool’ factor it has :-) ..
Charles MacDonald has recently been posting information about the DECO Cassette system in order to get some more tapes dumped because there hasn’t really been any activity on them since way back when the initial batch was added. This is good news because these things (being magnetic media and custom dongles) are extremely fragile, and the remaining ones REALLY need sourcing and dumping before it’s too late. Of course, all that work isn’t much good if there’s nothing to show for it, but luckily there is. 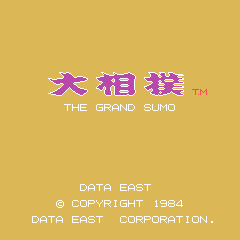 Here is ‘The Grand Sumo’ one of the previously undumped DECO Cassettes. In the end it was a simple slot-in to the driver (Type 4 dongle, BIOS Type A) so I can’t really take credit for anything, but Charles’ fantastic work, and the contributors who have helped buy the game and equipment needed deserve a shout out here. AFAIK the Dumping Union *don’t* currently have access to the other rare games, and if they show up they’re bound to be pricey, so please consider donating to them if you want to help source these rare and fragile pieces of history. One of the most important things to note about Charles’ work is it means the dumping is now a NON-DESTRUCTIVE process. The dongles are dumped without even opening them, so it’s risk free compared to older methods. This is good news for people who own the cassettes if they’re considering loaning them out. Ok, this update has nothing to do with Donkey Kong at all, Donkey Kong doesn’t even use samples anymore, but nevertheless it is about Monkeys. Actually, maybe it isn’t about Monkeys at all either, but it is about the lossless audio compress format ‘Monkey’s Audio’ or, those .APE files you sometimes find. Monkey’s Audio (MA) is one of the other big players in the lossless audio compression arena along with FLAC, and WavPack. The main advantages of MA is that it offers better compression rates than FLAC, which for large files can be quite significant. The disadvantage is it’s slower, quite significantly slower. It’s a symmetric algorithm which basically means decompression takes the same amount of time as compression. 0.145 saw the FLAC code being enabled in MAME for use with samples (not yet CHDs), and as a test I’ve done a bit of porting and brought MA over with the same sample decoding functionality. It took a bit of work keeping the compiler happy (wasn’t quite 64-bit safe), and I’ve opted to compile the non-windows codepaths on Windows to ensure that it’s as portable as possible, but it works. As expected, it’s quite a bit slower than FLAC, and while it’s not quite as fast as it could be due to me disabling some x86 ASM / MMX code the sample implementation still gives a pretty strong indication that it wouldn’t really be fast enough for decoding of CHD data where we need data to decompress with minimal overhead. I know a few people had been wondering / asking about this, which is one reason I looked into it. I might do a hookup later to test, but IMHO it’s not worth it. I wouldn’t hold your breath on this being officially included, although I’ll submit it anyway. More of a fun little experiment than anything else. The official anniversary is generally considered to be the 5th, so, this coming Sunday and the date has come to correspond with the release of a new full version, 0.145 in this case. I’ve been doing my bit to clean up / fix some of the recent issues, as well as some which have been lingering from the Data East rewrite I did a bit ago, while converting the remaining drivers over to use the generic handling but I think for the highlighted issues it’s going to take a big push from the people concerned (Aaron, Kale etc.) either today or on Saturday if they’re to be fixed in time for a proper stable anniversary release. I have a feeling official support for the FLAC CHDs won’t make such a release due to the priority of other stuff being higher, although I have just submitted code to allow sound samples to be in either format which will hopefully make the build. It’s good to try and make anniversary builds special, throw in a few surprises. The 10th anniversary was especially cool (5 years ago!) with a good number of interesting things, and a special modern build of MAME 0.1 to boot. I guess it’s also worth mentioning that PC emulation in MESS recently improved to the level whereby you can actually run the original MAME 0.1 binary inside of MESS (albeit slowly!) which is pretty neat. If there are any surprises this year they’ve been kept well under wraps, I did want to sneak one in myself but the contact I was working with on one has been unavailable for a month, so progress has temporarily stalled there, and the other possible one I still haven’t managed to get the green light for inclusion, always next year, or the year after. Either way, 15 years is an impressive achievement and while the project isn’t pulling up trees at the same rate it was you do have to wonder where we’d be without it, how many other projects and current games / ports would be different without it providing a reference point for all to use. 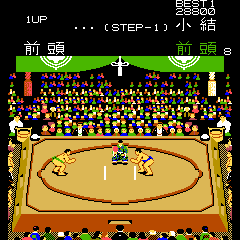 It’s also been a great eye opener to arcade culture around the world, as unpopular as things like Mahjong are with the non-Japanese crowd the sheer number of titles listed is testament to the success of the genre in Japan, likewise how many people would know Korea had it’s own arcade industry, producing games which were mostly ripped from more popular ones? How many people have had their eyes opened to companies like Cave by review sites written by people using emulators? How many people have picked up programming skills, and an understanding of obscure assembly languages by trying to contribute to MAME? As an educational tool it’s been immense. There aren’t many projects which survive 15 years where there is still just as much can be done today as there was back then. MAME is almost as old today as some of the first hardware/games it emulated were when 0.1 was released, think about that one for a while. So… even if 0.145 does come out and ends up being a bit buggy you can also look on the bright side, at least you’re still seeing regular releases 15 years from when the project started, and everybody has access to the latest code via the GIT repository these days so you can build yourself a fixed build as soon as any fixes go in. * It’s possible the Saturn breakage (Radiant Silvergun specifically) occurred earlier, but I believe it was traced back to that. Likewise the cheat issue might be fixable by changing all existing cheat files, but I’m not sure that’s desirable behavior.